Thanks for the many many help especially these days. to escape the tribulations that are near and to stand before Thee Lord, the Son of Man, our Saviour & Great Provider. Amen! Holy mother help David and his family safe fas radical canver treatment. Bless all my Family. In the name of the father . Amen. Oh Blessed Mother please continue to blind Satan in my husband though your Flame of Love from your Immaculate Heart where the power of your son Jesus’s sacrifice can be felt so profoundly. Hubby’s having financial problems now awaiting our divorce to finalize, am hopeful this will help him see the wrongness of what he’s doing, self destruction and 41yr marriage and family destruction. God has been putting road blocks in this divorce process all along, Alleluia! Thank you Lord! I laid my husband at your sons feet a couple years ago. He needs to change his stone heart to a natural heart so he can hear the promptings of the Holy Spirit and return to Jesus’s loving arms. Am awaiting his return home as a new creature in Christ. Holy mother bless David with strength and fortitude to withstand his treatment. Help Geraldine, James and Sarah to be strong. In the name of the father.Amen. Please pray for my apostate daughter that she might o return to practice of the Catholic faith, that she fall in love with her blessed Lord, and shun all that is demonic and hurtful in her life. Please pray for my mother in law that she be restored to full health and be blessed with many more years of life on this earth. Please pray for my family that we might be reconciled to our extended family. Oh Holy Mary, mother of God, pray for me. Please ask God to heal all addictions in my family. Please put temptations out of our lives and to keep our focus on God. The adultery is hurting me so deeply. Lead me to what I should do. Send me the wisdom to handle his unfairness for I am broken. Bring my children back to the church and God back in their lives. Please pray I get selected for a job closer to my parents and that it will be a pleasant place to work. In the meantime, pray for me to have peace where I am and that I do my very best work. Thank you. Dear Mother Mary, please heal our son, my husband and I of our anxiety and depression. Please also heal us of allergies, asthma, heart disease, diabetes, fibromyalgia, TMJ and sciatica. Please Bless us Spiritually, mentally, physically and emotionally. Thank you Blessed Mary and Jesus. 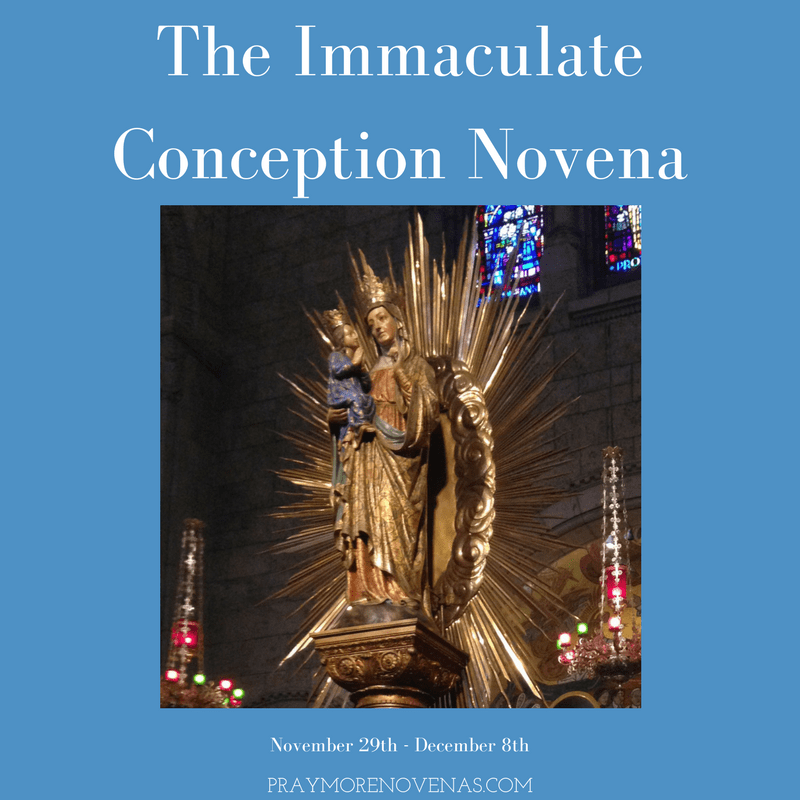 I pray for all praying this novena and for my own intentions. I pray that my brother may receive remission from his very aggressive melanoma. I pray for my husband, daughter and son for their food health. Safe travels for my family as we travel abroad, and success for my daughter for when she returns home? And for her heart and spirituality. Dear Blessed Mother please take my prayers to your son, so they can be answered according to the will of our Lord! I lift up my youngest daughter who just lost her job. I ask for doors to open and good opportunities to come in front of her. Please pray for wisdom and maturity. But most of all I pray for spiritual guidance for her. I lift up my oldest daughter and son in law — please show them the way to parent their little boys with rules and firmness. I lift up Ryan and pray that work picks up for him. Blessed Mother, please ask Jesus to help our son in his chosen career. We are so thankful for the opportunities that he has received this year—but we pray he lands a full-time professional job in a metropolitan symphony.. I pray for his safety always but especially in the winter as he travels in treacherous weather. I pray for safety for Joe and me as we travel to hear him play and success in each performance he has next week with the Boston Pops and Vintage Vocal Quartet. I pray for Adam and Kate’s spiritual life and that he comes back to the Catholic Church. I lift up my sweet husband’s back and rib pain and pray it is nothing serious. I lift up all of my clients past, present and future and ask for a special guidance wisdom and blessing as I work with Chase, Sheila, and Curtis. I humbly ask that more church doors open up for me to share Strengths in the faith community. I pray for all of my children, my husband and me to have a very blessed Advent! By your grace I ask my Blessed mother, to bless and fulfill my needs as she fit, my memory my fears and health. I also pray for my children and grandkids, that they will love and know you with all of their heart putting you first, omitting material and other addictions that doesn’t please the Lord, lead their children to the lord.Amen Thank you Mother and son. Please pray that my son and daughter-in-law are free from addictions. Pray that they are employed and using their money on housing and food. Pray that they are able to be responsible adult parents to their children. Pray that their family together finds their way to love, peace and Jesus. Also please pray for my daughter and son-in-law for their acceptance of the heartbreak of a childless marriage. Pray that they can strengthen their marriage and their faith and go to mass more frequently. Pray for my sister so that she may heal in body, mind and spirit so that she may return to church. Pray for my fiancé who recently returned to mass but now needs to take the next step to go to confession so he may receive the Blessed Sacrements. Pray for our President, those in office, the good priests of the world who are disrespected by so many. Most Blessed Mother please guide us to your most precious Son, Jesus Christ. Please pray for the repose of the soul my mom and my cousin,Rick. Both who recently died. And for our families. And pray for my friend, Jim who is seriously ill, baby Emily recently diagnosed with trisomy 18 and her family. For my friends Maureen and Janice going through cancer surgery and soon chemo. My cousin Michael suffering from Alzheimer’s. For my children and grandchildren. For my brother. And for me that the Lord will show me where he wants me to live. Dear Mary, I’m asking for your grace and mercy, upon my life, my relationship and for my brothers. I’m praying to have children that I’ll bring to your alter , to honor and worship you. Praying for a job and a life that will bring me happiness and praying for this unhappiness and depression I feel. My husband and I are asking for Mary’s intercession to help us conceive a child. I ask that my body be blessed and prepared to conceive one of God’s greatest miracles. Also praying for Mary and Jesus to help prepare us to be the best parents we can be if we are blessed enough to conceive a child. Pray that I may have patience through the entire process and that I am continually reminded that it is all in God’s time and not my own. Blessed Mother Mary, you are the Immaculate Conception, and I implore your help. Please pray for my family to be reunited. My brother’s daughters want no part of him, and by extension, they have cut themselves off from not only their father, but a grandfather, and aunts, uncles, and cousins. Mother Mary, ask your Son to touch their hearts and bring them to us. Their 97 yr old grandfather is starting to fail, and it would be such a blessing for him to be see his grandchildren, or at least hear their voices once again. I also ask your prayers for my brother-in-law who has so many serious health problems. Please pray that Jesus touches him and heals him. I also ask your intercessions for Karen, who is having thyroid surgery on Nov 30, for Kathy, who is receiving chemo, for Sr. Ann, who is recovering from a mild stroke, for my father who is seeing a surgeon about a prolapsed stoma on Dec 4. Dad has other health issues as well. I ask your prayers for my own health problems–fibroids, gut health, trigger fingers, chest pains, etc. I am so stressed. Dearest Mother Mary, pray for those in my family who no longer practice the Catholic faith. Draw them close to you and to your Son. Ask that all those who have left the true faith will be guided home. I also ask prayers for my parish, our pastor, our leadership team, and for guidance and direction to those who are in positions of leadership. Pray, too, for the U.S. bishops to be strong and to show courage as they prepare for the February meeting of bishops in Rome. May the Holy Spirit show them the way to be transparent and strong in resolving the abuse crisis. I pray for all the victims of abuse. I pray that they heal and that they be made whole. I pray for all the perpetrators, that they will openly repent and make restitution for their sins and crimes. Purify the clergy and religious. Immaculate Conception, pray for us. Please pray and help me for healing of my sickness . And good promotion good income . A good blessed marriage life u will choose the person for me in my life. Please mom tell Jesus Amen. Love u mom my Jesus Amen. Please Mother Mary, pray for our country, pray for our safety of our President. please pray that my family so we don’t go in to financial problems with less working hours, Pray for happiness help me find it again. Pray for my son at college may he be safe. PLEASE help my family and my husband’s family come back to us AND we ALL reunite one day SOON. We MISS them so much and especially as Advent approaches and Christmas is near, there is nothing more important then for our FAMILY being together again. My heart breaks and longs for their love. Please pray with me as I pray for you. We are many parts, but from ALL ONE BODY. I will pray for you and all your needs. Dear Blessed Mother, please intercede to our Dearest Jesus to please keep my Mom, Dad, Bob, my sister, myself and BillyP healthly, safe, and please guard, guide and protect us from all evil and danger. I ask you to please keep the arteries in and around my Mom’s heart and also all of ours be okay. Please help Bob with his frame of mind and try to have more compassion and have God in his heart and please help him get the house on Valley Road cleaned out and sold. Please let AlbertA have compassion for the situation. I ask you to please pray for SharonS, FrankS, DonnaC, DonnaP, JenC, JimF, RoseT, FredW and everyone on my sick/prayer list. Please help Tami and her family deal with all of their issues. Please pray for President Trump, his Cabinet, his Family and our Country. Please help us in Chester County next year with the election and I pray for RickL to have good direction to lead our County. I ask you to please let things go okay with my job so I can get at least my 35 years and or more. Thank you so much Blessed Mother for all of the prayers you have answered for me and my loved ones and friends through our Dearest Jesus, Amen. i pray for peace at my work place. I pray to blessed mother to please intercede for me ans block NL from entering our establishments.This person is creating a spirit of confusion among the staff. Please get rid of this person from out of the country . Please put up a wall between the director and this person, so he could see what this person is doing. Please open his eyes . Lord jesus, I place my financial needs into your hands, I NEED Money to finance my son throughout medical school.I pray for financial deliverance today. Holy Mary Mother of God pray for my nephew and his new wife return to the Catholic Church/Faith, or at least pray they find in their hearts to attend Mass on Christmas to celebrate the birth of Your Son, Jesus. Pray Oh Holy Mary Mother of God for Lorenzo and Cassie to have a long, healthy, strong and holy marriage and all their children will be strong, happy, and healthy. Pray Oho Holy Mary Mother of God for Genevieve, give her peace. Dear Jesus and Mary, please heal our son of his depression and anxiety. Help him to continue a strong faith in you. Please also heal his allergies and asthma. Please heal my husband and I of our heart disease. Please heal me of my severe anxiety. In Jesus name, thank you God. I pray for my son, Tom, that he will be more willing to communicate with me to keep me informed, as a caring father, what is happening in his life and share how his relationship with his children (our grandchildren) is going. Something as easy as an email or text message to check in to say “hello,” would be great. I believe he works hard to provide for his children and I pray that he is earning an income that will ultimately provide him enough to obtain some reliable form of transportation. I also pray that he find some way of worshiping our Almighty Father and set an example for his children. At this point, I don’t care what denomination he chooses…but, just do something. Why whisper ‘say your intentions here’? Silence is God’s first language.